Many years ago, while stationed in Germany, the Army occasionally insisted on interrupting our busy social lives to ask us to go out and practice defending the Free World against 3rd Shock Army and the rest of the Soviet hordes. To do this they equipped us with vehicles designed in the 1950's, built in the 1960's and which broke down regularly in the 1980's. On one such occasion when smoke was billowing from the front, noisy part of the armour, I asked Bombardier Clark what the problem was, "The problem is Sir," he replied, adopting his know-all driver-mechanic tone, "the fvcking thing is fvcking fvcked." I imagine that would pretty much be Bombardier Clark's summary of the Deepwater Horizon rig were he in the vicinity when disaster struck. 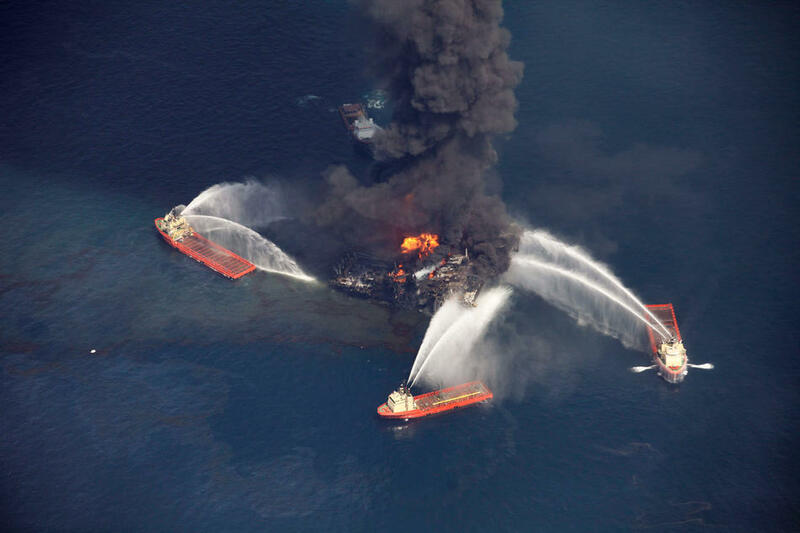 BP shares have been malleted since the Gulf Deepwater Horizon rig blew up and sank, killing 11 men and initiating massive contamination of the Gulf. Whilst BP have committed huge resources in attempting to minimise the environmental impact and are working ceaselessly to stem the leak, the outlook remains grim. It strikes me that the media in the UK haven't quite got a grip of the scale of the disaster but as oil is beginning to hit the shoreline coverage will go up a few gears. The oil industry has always operated at geographical and technical extremes. Putting aside for a moment the tragic loss of life and the growing impact on the environment, economy and people of the Gulf states, the engineering challenges apparent are fascinating. I hope for the sake of the former that the boffins can pull this off. A number of initiatives have been tried to stem the flow but with mixed success. BP claim that they are now siphoning off 5000 b/d from the leak and given the thing continues to spray oil into the Gulf, (webcam here), it's obvious that the leak is producing much much more than the 5000 b/d that BP have been claiming for the last month. There is a "top kill," injection scheduled for Sunday. In simple terms they will attempt to cap the well by injecting mud at greater pressure than the leak and then cap it with cement. The most important undertaking though, is the drilling of two relief wells to kill the initial one and this, this is something else. 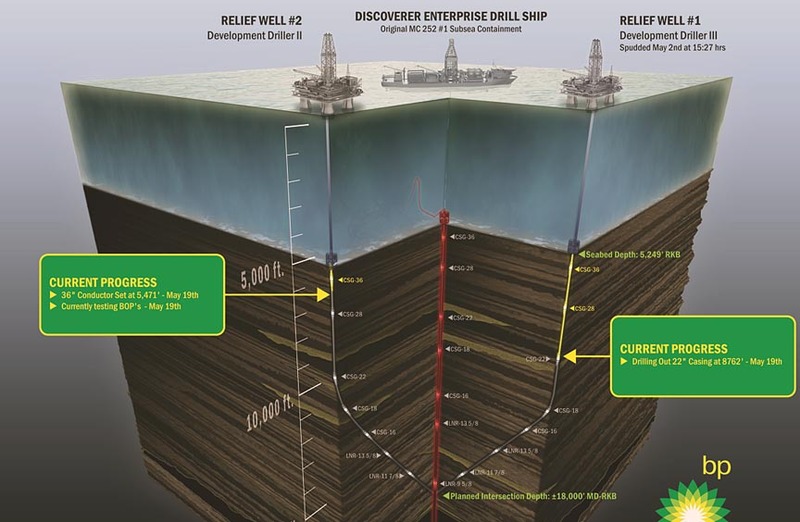 At a depth of 5000 ft they hit the seabed and drill 5,000 feet down through the mud and then another 8000 feet at an angle aiming to intersect the original vertical pipe which can't be much more than 24'' across. It gives new meaning to needle and haystack and I dread to think of the permutations of things that can go wrong. Unfortunately, while the "sheen," from the oil, the light film on the surface, has been apparent over a very wide area, the underwater and heavier oil is now beginning to appear in the marshes of Louisiana and surface traces are being drawn into the Loop which in the worst case would draw oil onto the beaches of Florida. As the days pass the news flow is likely to become more emotive as the oil spreads on the shorelines. For the people of the Gulf states, who seem to go from one disaster to the next, none of this is good news. With a higher than average hurricane season forecast the threat to human health will increase if high winds blow oil particles inland to contaminate metropolitan sanitation. The engineering challenges are complex; to keep up to date with technical matters go to The Oil Drum. Some of the discussion threads with contributions from industry veterans and engineers are fascinating and give an insight into the enormity of the work required. You may however, think of this disaster as nothing to do with you. Unfortunately, you'd be wrong. The insurance industry is already well aware of the potential cost and Lloyds and the reinsurers will be hammered. With the hurricanes coming, they are calling it a perfect storm. They will of course get the money back, mostly from you and me in the form of higher premiums over the next few years from every part of domestic and commercial insurance which I'm told, is what they want because premiums are very depressed at the moment. Oh, and petrol is going to get more expensive but that comes much later. Funny, the way things work out.